While I find pan roasting a steak more than an acceptable cooking option, there is something special about using the grill. In this recipe video, I show you how to grill a flank steak, which I season simply with salt and pepper, but then flavor with a bit of homemade pesto sauce. 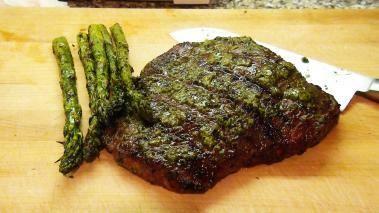 The pesto, which is grassy, savory and delicious, chars just a bit on the grill, and gives the steak an added pop. With a fresh salad, and maybe some potatoes on the side, this is one of my favorite summer "outdoor" dinners. Hope you enjoy it, as much as I do. Any time you cook steak, you need to get a good sear/char on the outside to really develop the flavor. The way to do that, is to use really high heat (so let the grill get going 15 – 20 minutes before you start) and don’t play around with the steak too much. I generally flip mine just once. Know your doneness. I like med-rare; You can cook to whatever you’d like, but know how to tell rare from well done. I’d suggest you take a look at these Five Rules for the Perfect Steak. It helps to have the steak at room temp before you start cooking. Use a good pesto. I like my pesto recipe, but if you want to use store bought, that’s fine. Just make sure you taste it, and like it. I made some grilled asparagus to go with my steak, long with some potatoes and creamed spinach. Hope you enjoy it as much I did.